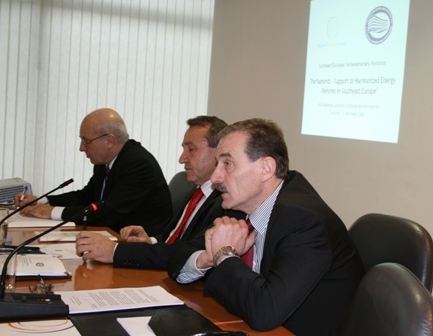 The workshop “Parliaments – Support to Harmonized Energy Reforms in Southeast Europe” will present a Western Balkans energy policy survey, prepared by International Energy Agency experts. It will discuss implementation of the Energy Community Treaty, EU energy policy, Western Balkans integration and the EU, energy efficiency as a tool in mitigating climate change, energy supply security, competitiveness and new employment. The event will be opened by the Chairman of the Committee for Transport and Communications of the Parliamentary Assembly of Bosnia and Herzegovina, Branko Dokic, the RCC Secretary General, Hido Biscevic, and the Head of the Regional Secretariat for Parliamentary Cooperation, Vladimir Danchev. Representatives of the European Commission’s Directorate General for Transport and Energy, the World Bank, the UN Economic Commission for Europe, the International Energy Agency and the Energy Community Secretariat will also participate in the event. Journalists are invited to attend the workshop, which will last from 10 a.m. until 5 p.m. on Monday, 15 December 2008, at the premises of the Parliamentary Assembly of Bosnia and Herzegovina, Hall 1/I, ground floor, Trg BiH 1/V, 71000 Sarajevo, Bosnia and Herzegovina.